If ever there were an SUV to fit the stereotypical Aussie outback narrative, the Ford Everest is it. Along with a host of 4x4 ute-derived competitors like the Holden Trailblazer, Mitsubishi Pajero Sport, Isuzu MU-X, SsangYong’s new Rexton and the Toyota Fortuner, the Everest offers real ground clearance, proper off-road ability and diesel dependability for the adventure-loving family. The reality, of course, is a little different, but the 4x4 wagon has found favour with long-range towing tourers looking for something that’s more practical and comfortable than a dual-cab ute. Our Everest Trend 4x4 tester comes complete with Ford’s newest 157kW/500Nm 2.0-litre four-cylinder twin-turbo diesel engine and ten-speed automatic gearbox, four-wheel-drive and seven seats. It’s equipped with extras like automatic headlights and wipers, adaptive cruise control, lane departure assist and AEB, as well as a programmable keyless entry, 18-inch alloys and more. Its Sync 3 multimedia system offers Apple CarPlay and Android Auto functionality and runs through an 8.0-inch touchscreen. LED lighting features throughout the car, too, and there’s a powered tailgate. The Achilles heel of the Everest, though, is its high price. At $61,491 RRP before on-road costs, it’s the priciest in its sub-sector by some margin. A quick look at some 4x4 wagon rivals shows just how over the odds the Everest’s pricing is compared to some of similarly specced 4x4 wagons. Holden’s Trailblazer Z71, for example, is $53,490, the Isuzu MU-X LS-T is $48,900, Mitsubishi’s Pajero Sport Exceed is $54,200 and the Toyota Fortuner Crusade is $56,990. Ford insists that the Everest should be pitched against rivals like the Toyota Prado, but like-for-like, the Everest shares more in common with other body-on-rail wagons that can trace their origins to a commercial pick-up. It’s a big rig, so the Everest is not surprisingly generous in its interior dimensions. Three people can sit across the middle row with ease, and there is also plenty of headroom for even the tallest passengers. There are two ISOFIX baby seat mounts for the outside pair of seats. The cloth trim seats are deep and comfortable, though they are a little lacking in side bolster padding. There is a pair of USBs under the dash along with two 12 volt power points and a multimedia touch screen system. There are plenty of places to stash stuff within the Everest, including twin bottle holders in each of the doors, a pair of cup holders in the front centre as well as a pair in the centre in the second row. And you can even stash a 15-inch laptop in the huge glove box, and you can charge it from the 230v inverter socket in the second row. All seats fold down quickly and easily to reveal a large cargo space of 2010 litres up to the roof, although the large rear wheel arches do get in the way for awkward loads like bikes. The gap between the rear floor and seat fold is a little annoying, too. Folding just the third row of seats down reveals 1050 litres of boot space, and there’s 450 litres of space with the third row of seats in place. Another annoyance; it’s too easy to trap the seat belts in the seat fold, which means you have to undo the seat again to sort it out. There are seven airbags including full-length curtain bags fitted as standard to the Everest, along with AEB, lane-keep assist, a rear-view camera and sensors, adaptive cruise control and (overly active!) front collision warning system, which all contribute to a five-from-five ANCAP safety rating for the Everest Trend. The Everest is covered a five-year/100,000km warranty, while servicing is recommended every 15,000km or 12 months. Its fuel tank holds 80 litres of diesel, which should cost around $120 to fill (March 2019). You’ll also have to budget for AdBlue diesel emissions additive as well, though a tank of AdBlue lasts around 15,000km and it costs about $60 to fill the Everest’s 18-litre tank. The price of the first service is capped at $360, the second at $585, and the third is $470. It then rises to $585, before falling back to $360 for the five-year service. The leather seats of the Everest Trend are wide and reasonably deep, while the driver’s seat has an impressive height range. There’s no height adjustment for the passenger side, though. The second row is wide and roomy, while the rear two fabric seats are easy to erect and are reasonably sizable. The 60/40 split middle row slides forward to allow relatively easy ingress, too, and there are cup holders for the third row. It’s not a space for adults, but it’s bigger than some of its rivals including the Fortuner. Extra sound deadening and a clever noise attenuation (using the same principle as noise cancelling headphones) keeps the cabin quieter than the donor Ranger, although the large door mirrors do allow for a little bit of wind noise at highway speeds. The new diesel, too, is quiet and composed. The Everest uses coil springs in the rear in place of the Ranger's leaf springs, which gives it a much more car-like ride. The steering, too, is surprisingly light and easy to use for such a tall, long 4x4, though the long, soft brake pedal isn’t a personal favourite. There’s no hiding that it's nearly 2.4 tonnes of wagon out on the open road, though. The ride is soft and supple over all surfaces, verging on too soft in body roll control at times. Of course, it's not meant to be hurled around corners like a Mustang, either. With 225mm of ground clearance, good articulation from its coil-sprung suspension and short front and rear overhangs, the Everest’s off-road prowess is formidable, too. A limited run on a mixed gravel road reveals a wagon with excellent cruising abilities over unsealed surfaces, thanks to that softer, more compliant coil-sprung ride. There’s also a comprehensive terrain management system coupled to a low-range 4WD mode if you’re really keen to get out in the wild. The engine – also used in the 4x4OTY winning Ford Ranger Raptor – is flexible, quiet and refined, and while its 500Nm is enough to propel it at sufficient pace across level ground, it can be caught off guard by rolling hills, where it falls out of its power band a bit too easily if the revs drop away. The 10-speed auto is a great match for the engine’s output, but it too gets caught flat-footed by the odd steep incline, taking a moment too long to drop down to a more suitable cog. It can also be slow to engage when you’re asking for a hurried reverse. Having said that, a brief tow of a 1900kg trailer combo revealed no shortcoming in the smaller engine’s ability – the Ford Everest is rated to tow 3100kg, 100kg more than the 3.2-litre five-cylinder version. It can also carry a little more payload (713kg vs 692kg), thanks to the lighter engine. We saw a dash-indicated fuel economy figure of 7.9 litres per 100km over 434km of testing, against a claim of 7.1L/100km. A cruising range of around 1100km is theoretically possible aboard the Ranger. 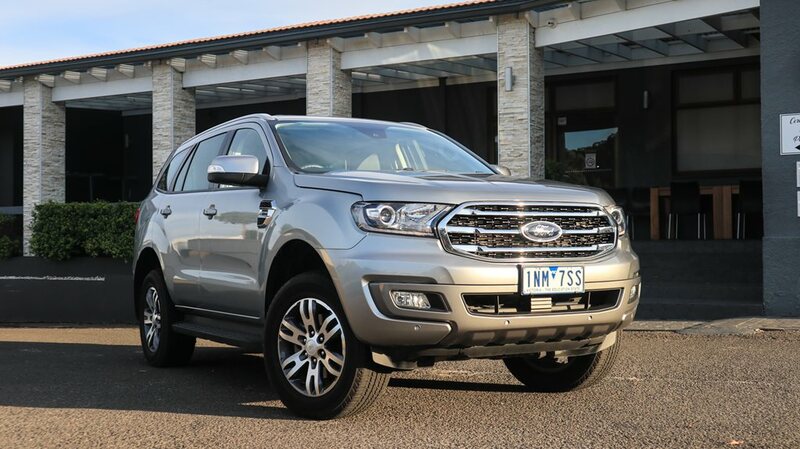 The Ford Everest 4x4 Trend is expensive when directly compared with its most immediate rivals – in fact, Ford prefers us to compare it with things like the Toyota Prado – but it’s a quiet, competent, roomy seven-seater with decent towing capacity, reasonable fuel economy and good levels of equipment. It’s also got genuine off-road chops and a cutting-edge drivetrain. If you can handle the cost of entry, the Everest’s versatility can really help to justify the fiscal stretch.